Redline stand alone engine management systems are the most affordable, more powerful, simple to tune system on the market today. There are more powerful systems for 2-3 times the cost, more simple systems with far less tuning potential, and significantly more complicated to tune systems with much less ability - Redline systems have been created to meet the balance in all these areas. R422 systems provide up to 2 coil drivers, 6 injector drivers and up to 2 GPO's, R422 systems are sequential fuel only, R422D add distributor ignition, R422D systems add degree based, crank fire sequential ignition (2-cyl) or waste spark (4-cyl) with up to 2 - 3D GPO's. 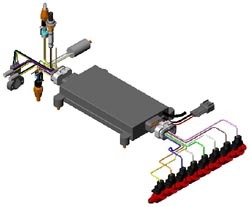 R882 systems provide up to 8 coil drivers, 8 injector drivers and 4 GPO's. R882 systems are sequential fuel only, R882D add distributor ignition, R882C systems add degree based, crank fire sequential ignition (up to 8-cyl) or waste spark (10-16-cyl) with up to 2 - 3D GPO's. Redline systems offer flexible phase based setup tables that allow the control of virtually any motor - even fire, odd fire, rotary, 1-16 cylinders with timing resolution to 1/4 degree ("c" systems) and operation to over 30k rpm. Injector and GPO drivers are rated at 8 Amps meaning multiple high or low impedance injectors can easily be used, coil drivers are rated at over 25A created the most powerful spark on the market (most of our competitors use 1A drivers requiring a CDI or external power stage). Most of the tuning is done in 3 main screens using our intuitive windows based software interface. Pop-up tips in each programmable field, our in-depth tuning manuals and included tech support ensure there is no question you won't have answered as soon as you need. Redline in partnership with Lang Racing Development are dedicated to not only providing, but supporting the customer through the install and tuning process, we're looking forward to helping with your project!